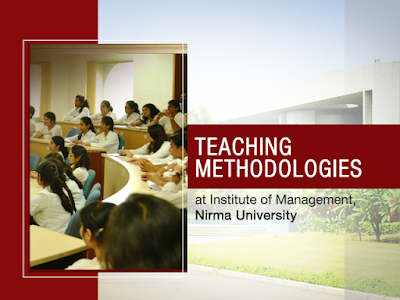 The Institute of Management, Nirma University (IMNU) is a product of the visionary Padmashree Dr. Karsanbhai K. Patel. As one the top management colleges in Gujarat, since its inception in 1996, the institute has been imparting quality business education and boasts of excellent faculty members who have helped shape exceptional leaders and managers of the industry. Listed amongst the top MBA colleges in India, the institute was ranked as the top 22nd Best B-School by Dalal Street Investment Journal in February 2018. It was also ranked as the 4th best Private B-School in the Super Excellence Category by CSR-GHRDC B-School Survey and published in Competition Success Review, November, 2017 issue. But the journey to the top has only been possible because of our unique teaching methodologies, which help students learn in an environment which is experiential, fun, enjoyable, and highly conducive for adult learning. To remain in the top league B-Schools, the Institute follows an Outcome Based Education (OBE) by developing and nurturing a culture of excellence in teaching, training and research. The Outcome-Based Education (OBE) is practiced by leading B-schools, and is a student - centric approach as compared to the traditional form of education which has always been more teacher-centric. It means, each student of the Institute is motivated to take the ownership of his/her learning and reflect on the learning process. IMNU ensures effective learning by using a mix of pedagogy such as case study, simulation, discussions, presentations, role plays, project work, etc. in addition to the traditional lecture method to make teaching-learning process more experiential and participative. Students work on a host of projects in different courses as well as across courses, but the internship and project-based courses are part of different curricula. These courses are supervised and students are given sufficient support by faculty to apply their learning and learn from real life situations. The teaching and instructional methods used at the Institute encourage self-learning and learning through active student industry interaction in the form of practical assignments and projects. Continuous evaluation of learning is followed at the university. Efforts are made to measure cognitive as well as applied learning. Project work, quiz, problem solving exercise, classroom assessment methods, end-semester examination, etc. constitute the different components of the overall assessment. Every programme at the IMNU has a programme learning outcome that is derived after consulting all stakeholders, benchmarking and intensive internal discussions. Only then are the course learning outcomes developed, on the basis of the programme outcomes. The course content and assessment are based on the course learning outcomes. Each programme has mechanisms for the assurance of learning. For example, the rubrics are developed on the basis of course learning outcomes and various assessment mechanisms are developed to assess the level of learning amongst students. Finally, the assurance of learning results in improvement in the teaching-learning process. Regular feedback is received from the students regarding course materials, pedagogy, and relevance to the current requirements of business and industry. The students share their summer training and project experiences with each other, faculty and also with the first year students through presentations. This helps the faculty to identify and address any specific problems that the students might have faced. It also helps the first year students to prepare themselves better for their summer training. The teaching methodology used at IMNU is a judicious blend of lectures, seminars, case discussions, group presentations, management games, syndicate discussions, and special lectures by professionals from industry. As the leading top management colleges in Gujarat, modern teaching aids such as overhead and LCD projectors, computer aided instructions, films, video, and audio tapes are also utilised. The teaching methodologies used at the Institute encourage self-learning and education through active student industry interaction in the form of practical assignments and projects.